Belo Horizonte was a special part of my trip to Brazil, and I stayed about a month in total with my friend Luiza’s family. So it was Luiza who planted the seed of going to Brazil for me. There were other influences as well, but after living with Luiza in Amsterdam, I wasn’t ready to say goodbye to my awesome roomie and not have any idea when I would see her again. So when I knew it would be Christmas when I would be in South-America, Luiza suggested I should celebrate it with her and her family in Belo Horizonte. A very enticing idea, since I was even contemplating going back home for it. It was very odd to celebrate christmas in Brazil. I associate the holiday with winter, cold and often snow. Belo Horizonte on the other hand was in full summer swing and a tropical 30° Celcius. The icons of snowflakes and a santa claus with hot woolen clothes looked more than a bit ridiculous, but I was happy to catch some of the Christmas spirit I would normally have back home. It was also weird to celebrate it with another family, but I was immensely grateful Luiza and her family offered me their hospitality, and I had been collecting gifts from my travels to hand out on Christmas. Belo Horizonte is a city that is not at all on the traveller’s path. Mentioning the city to people I met along my trip was met with a blank stare. It makes sense in some way since it doesn’t have the alluring beaches like Rio de Janeiro or Bahia, or isn’t the great cultural and economic hub like Sao Paulo. But greater Belo Horizonte does have approximately 5million inhabitants, and is the third biggest city of Brazil. That’s almost half the population of Belgium, so hardly to be overlooked! BH (or Beagá as locals call it) is located in the mainland of Brazil. not quite as far as the Amazon, but the leftover trees in the city give off quite a jungle-vibe. Being so far from the coast, it’s not a place you just ‘happen’ to pass by. One goes there with an intent. For me it was visiting a friend, but BH prides itself on being the city with the most bars, and the best bar food. A point I can hardly contest; the best activity to do in BH is sit, drink, eat and chat. Other than its food, there was plenty of things to discover in and around BH. Luiza did her best to show me around, but a full month of visit gets very intense, so I didn’t mind when we didn’t do an activity every day. I also went back to Sao Paulo to visit the other Luisa again, and give BH Luiza a visitor break. I don’t think I would have been able to see so many things in BH without Luiza though. Not only do you need a car to get to most places (or sit on a bus for hours) but it’s 100 times more fun to see it with a good friend to show you around. Which is probably why most travelers don’t immediately see the attraction of BH. 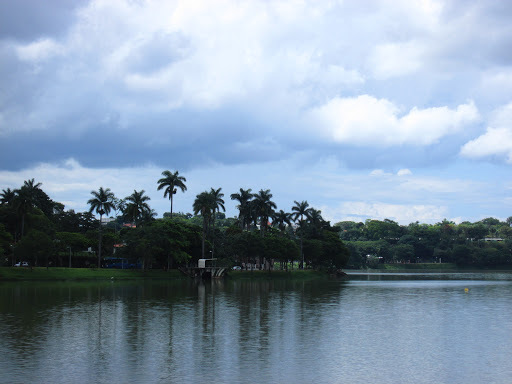 Noteworthy things in Belo Horizonte: Pampulha, the gigantic lake a bit out of the city center. This is where the rich live, and which was meant as the playground for famous architects like Oscar Niemeyer. The huge university campus was closeby as well, which Paulo (Luiza’s brother) showed me. And the football stadium was also in the area, where some games for the next world cup would be held. Parque das Mangabeiras, a ‘park’ at the top op the city was also amazing. It was basically a jungle with pedestrian paths through it offering astounding views of the city. Parque ecologico was a beautiful park in the traditional sense, fit for a picknick, and they handed out free bicycles to cycle around with in the park. The pope square, which pope John Paul visited a few years before, also offered an amazing view. We impulsively decided to go watch the fireworks lit in Pampulha from the square on New Years Eve and were not disappointed, except for the insane traffic around the square. BH offered many more amazing views since it was literally build in these glooming jungle hills. Which made the pope say at his visit “they really are beautiful horizons” (which is literally what belo horizonte means). There were also plenty of museums to visit, and the old colonial architecture in the center was amazing. 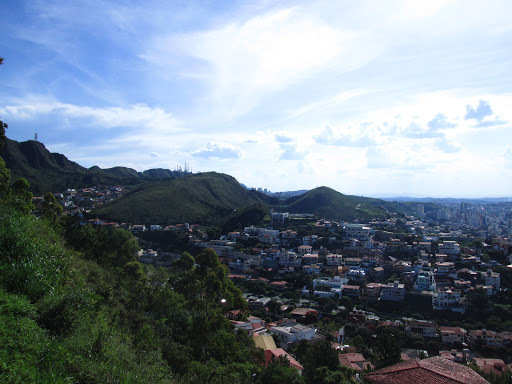 Belo Horizonte is the capital of the province of Minas Gerais, literally the mining province. It was built as a hub to get all the precious natural resources of the jungle to the coastal cities and has always been important since. It’s also kind of the underbelly of Brazilian society. Protest against the military dictatorship a few decades before started out in Minas Gerais. And the most recent protests against the rising bus fare and World Cup outrage had its starting point in Minas Gerais as well. I also joined a playful protest/fun activity in the city with some of Paulo’s friends. The “praia d’estaçao” on the “praça d’estacao” (a wordplay where the station square became the station beach) made people dress up in their beach wear on the station square. Bikini’s, towels, beers, and the cherry on top; a water truck that was rented to bring some much needed coolness by spraying water onto everyone. The activity was kind of prohibited by the police, which made Brazilians rebel even more of course, chanting anti-police and anti-military quotes. It luckily didn’t escalate and was a super fun afternoon. If BH doesn’t have a beach, we’ll just bring the beach to BH. I was also asked by some friends of Luiza to join them on a camping trip. Luiza unfortunately had too much work to do, but I was DYING to go explore the mainland, so I enthusiastically joined this group of people I had never met before. We drove the car to Serra do Cipo, a beautiful mountain range a few hours away and stayed the night in these super cozy cabins in Lapinha, the closest village. We went hiking up the astounding mountains that reminded me a lot of the Chapada Diamantina park up in Bahia, and Ottavio explained me that it’s from the same mountain range, that goes all the way through Brazil. The Serra do Cipo had amazing waterfalls and we chilled most of the day in the water, jumping off the rocks into the bronze coloured water. I can’t imagine there had been many international travelers in Lapinha before and I was very happy to have the opportunity to visit it with some supernice locals. The activity I can recommend people most though was Inhotim. An hour or so drive from BH, this gigantic 5,000 acre park is the scenery for one of the biggest contemporary Art Park in the world. With 27 buildings with expositions and many more art sculptures out in the open, one day was not even enough to visit the entire thing. As a sort of Disney land for contemporary art lovers, it is definitely worth a visit. I unfortunately went on the one day during the week that the park was free, which meant it was completely FULL of families with screaming children. Not very pleasant to experience this huge art park that breathed tranquility is this way. Luckily it didn’t totally ruin the visit and the art was satisfactory enough. there’s a few other things I probably would have enjoyed to visit. Ouro preto, an old colonial town a few hours away, but it was not meant to be. I thoroughly enjoyed my visit to the vibrant city of Belo Horizonte, and I was so happy to see my friend again, and see how she lives. It’s an overlooked gem, Beagá, maybe some that traveled there for the world cup will spread the news, but maybe it’s better to be left untouched.